What's New: We've recently updated how Custom Fields work, and made some changes. If you've been using Custom Fields before March, 2018 make sure to review to learn how the new and improved Custom Fields work! To enable the Power-Up, open the board menu on the right side of the page, and select the Power-Ups menu option. 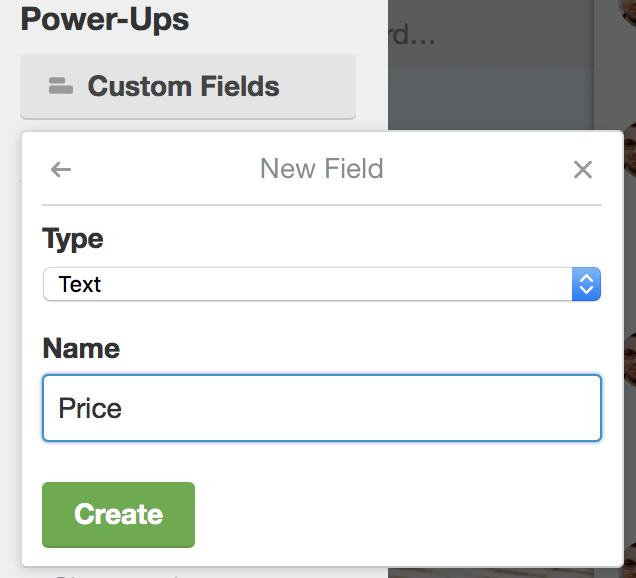 From the Power-Ups directory, you'll find Custom Fields under the Board Utilities category. Click the "Enable" button next to the Custom Fields Power-Up. Type will specify the type of input that can be entered for the field—this can be set to "Checkbox," "Date," "Dropdown," "Number," or "Text". 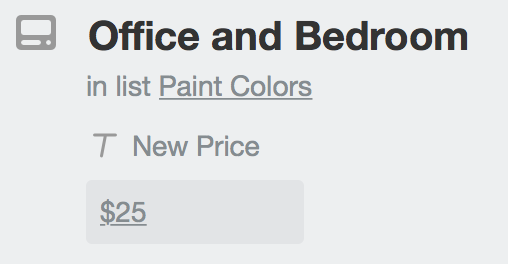 If you select "Dropdown," you'll have the option to enter the choices for that dropdown. Name is the name of the field. A field name can be up to 25 characters in length. Once a field is created, you cannot change its type. You can delete/edit custom fields from the card back. Please open the card and click the "Custom Fields" button on the right-hand side. Then, select the Custom Field you'd like to edit. A pop-up window will appear, and you'll be able to edit the Fields or click on the "Delete Field" link at the bottom. You can disable the Power-Up for the board by opening the Power-Ups directory, and clicking on the "Enabled" section. Then, click the Setting cogwheel and select Disable. While the fields will no longer show up on cards, you can re-enable the Power-Up and the fields and values you entered previously will still be there. 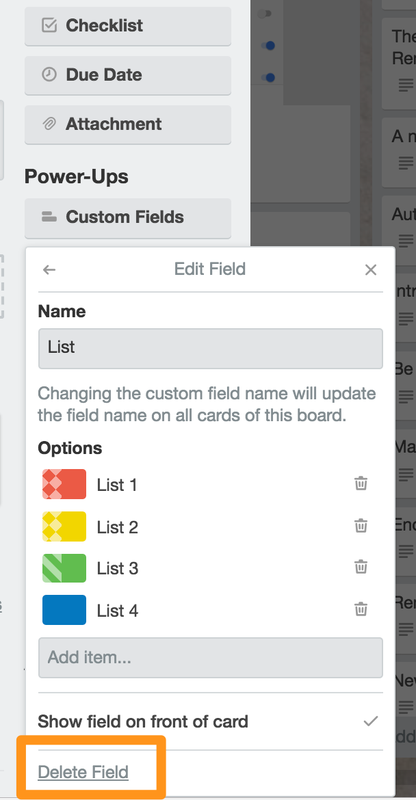 When you move or copy a card that has values stored in Custom Fields the data will be moved to the new board. You will need to enable the Custom Fields Power-Up on the new board to see the data, though. When the card is moved/copied, Trello checks to see if you already have a field on the new board with the same name and field type. If so, the card will use the existing field definition on the new board. If it doesn't find a matching field, it will create a new field. A card that has an empty value for a Custom Field will not create the new field on the board to which it is copied or moved. Custom Field Data is included in both the JSON export and, for Business Class users, the CSV export. To learn how to export your boards to either JSON or CSV, read our article here. A board can have up to 50 Custom Fields defined on a board. Any number of cards on the board can have values set for each field.